Sign up for our email newsletters to get customized updates on new Berghahn publications. If you are a periodical or other publication reviewing our content. If you are a professor requesting an examination copy. 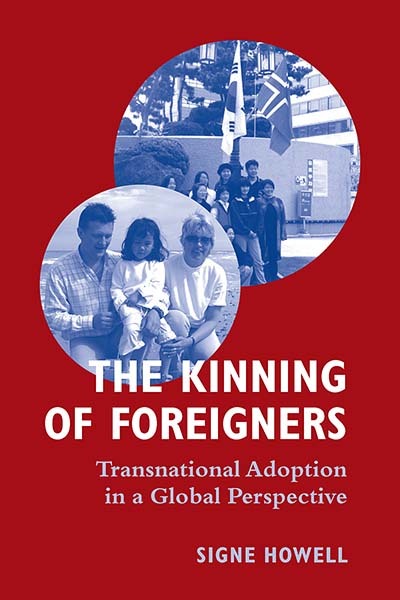 "Howell's fascinating work on transnational adoption provides real insight into its experiential, cultural, psychological and legal complexities worldwide and has important implications for our theories of kinship and personhood. Howell writes as an anthropologist, illuminating the topic by virtue of the comparative perspective she brings to it. The book deserves to be read not only by anthropologists interested in kinship, but by everyone who wants to understand children and to do what is best for them, including policy-makers, developmental and child psychologists, educators and social workers." · Christina Toren, Director, Centre for Child-Focused Anthropological Research (C-FAR), Brunel University. Since the late nineteen sixties, transnational adoption has emerged as a global phenomenon. Due to a sharp decline in infants being made available for adoption locally, involuntarily childless couples in Western Europe and North America who wish to create a family, have to look to look to countries in the poor South and Eastern Europe. The purpose of this book is to locate transnational adoption within a broad context of contemporary Western life, especially values concerning family, children and meaningful relatedness, and to explore the many ambiguities and paradoxes that the practice entails. Based on empirical research from Norway, the author identifies three main themes for analysis: Firstly, by focusing on the perceived relationship between biology and sociality, she examines how notions of child, childhood and significant relatedness vary across time and space. She argues that through a process of kinning, persons are made into kin. In the case of adoption, kinning overcomes a dominant cultural emphasis placed upon biological connectedness. Secondly, it is a study of the rise of expert knowledge in the understanding of ‘the best interest of the child’, and how the part played by the ‘psycho.technocrats’ effects national and international policy and practice of transnational adoption. Thirdly, it shows how transnational adoption both depends upon and helps to foster the globalisation of Western rationality and morality. The book is an original contribution to the anthropological study of kinship and globalisation. Signe Howell is professor of Social Anthropology at the University of Oslo. She obtained her D.Phil. from the University of Oxford and has been a lecturer in the Department of Social Anthropology at the University of Edinburgh. Before she began her research on transnational adoption (1999), her studies were focused on Southeast Asia where she has carried out fieldwork amongst a hunter-gatherer group in Malaysia and a group of settled agriculturalists in Eastern Indonesia. She has published widely on various aspects of social organization, religion, ritual and kinship. Her books include Society and Cosmos: Chewong of Peninsular Malaysia; Chewong Myths and Legends; Societies at Peace: Anthropological Perspectives (edited with Roy Willis); The Ethnography of Moralities; For the Sake of our Future: Sacrificing in Eastern Indonesia; The House in Southeast Asia (edited with Stephen Sparkes). She has also published a number of articles in books and journals on the topic of transnational adoption. PART I: ADOPTION - BIOLOGY OR SOCIALITY?